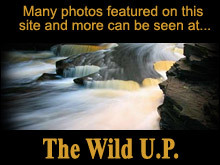 The Wilds of Michigan – Lake Superior, Inland Lakes, Rivers and Streams in the Porcupine Mountains area are home to many species of freshwater fish. Fish Lake Superior! Various species of Trout and Salmon, Herring, Smelt and Whitefish are what the Big Lake Fishermen are after. During the Spring and Fall, some of these species enter our rivers and streams to spawn. CHARTERS ARE AVAILABLE out of ONTONAGON HARBOR and BLACK RIVER HARBOR. Try fishing some of the rivers and streams in the Park any time of the year. 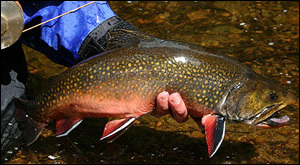 Brookie’s and Rainbow Trout are a favorite and, fantastic in the frying pan. You may even land a big fat Coaster Brookie, if you’re lucky. These guys coast the shoreline of the Big Lake and swim into inlets in search of food and then move on to another. The larger rivers, inland lakes and Lake Superior tributaries hold Walleye, Northern Pike, various species of Bass, Perch and Panfish. Bring a couple poles along. What a way to spend a lazy afternoon in God’s Country! If you’re into hard water (Ice) fishing, then you’re in the right place for that too. Rent an Ice Shack and equipment on Lake Gogebic by the day or week and you’re ready for a really COOL experience.